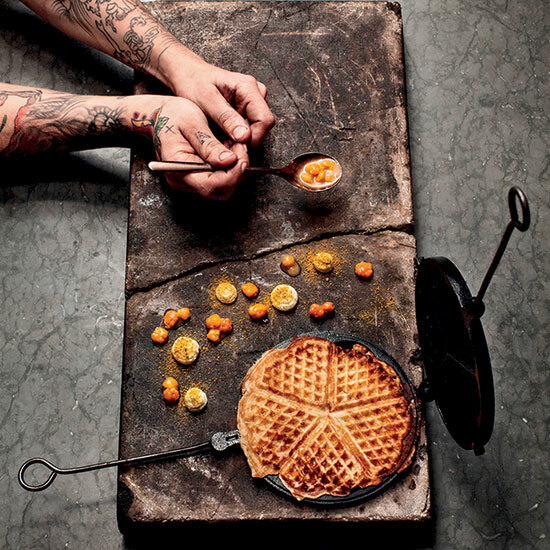 Writer Stephen Whitlock extols sourdough waffles cooked over live fire, smoked-reindeer sandwiches and more proudly Swedish dishes. Swedes and Danes have a long-standing and fierce rivalry. Over the centuries, they've fought countless wars, with Sweden generally viewed as the stronger imperial power. Yet, since Noma opened in 2003, Copenhagen has prevailed as Scandinavia's culinary destination, leaving Swedes to fume—and simultaneously try to score a table. Now, Stockholm is rediscovering its pride in its own culinary traditions, with new restaurants rethinking husmanskost—traditional Swedish food. When Ekstedt (ekstedt.nu) opened in 2011, it was booked for months. Once I secured a reservation, I found a room furnished with copper that caught the light from wood-fired ovens. Dishes like mackerel with smoked parsley are wonderfully delicate, while sourdough waffles with cloudberries are gently sweet. Oaxen (oaxen.com) looks to the present rather than the past. It recently moved from a remote island to a modern building in Stockholm, with a massive window overlooking the water. One of its dining rooms, Krog, offers a 10-course menu for $300. But I head for the more laid-back Slip. The menu is full of Swedish dishes: herring, lamb with carrot chutney. The best is a simple bowl of scrambled eggs served with pork belly and house-smoked bacon. The most inventive of the new-comers is Smörgåstårteriet (smorgastarteriet.se). It takes its name from the "sandwich cake," made here with layers of sourdough bread, roast beef and pickled vegetables. It's a highlight on a menu that's a tour of Sweden: Other sandwiches use shrimp from the south and smoked reindeer from the far north. Stockholm hasn't yet caught up to Copenhagen—the city has no rival to Noma yet—but here's hoping the Scandinavian food fight continues. Stephen Whitlock lives in Stockholm and writes for the New York Times.